With Father's Day fast approaching I wanted to take some time to reflect on some of the lovely times I've had with my Dad. 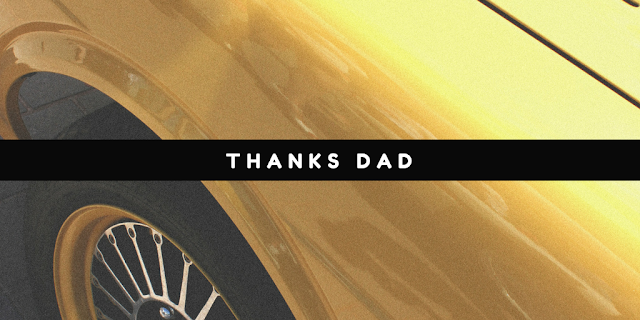 The Car People invited me to share my favourite car journey I've had with my Dad as part of their 'Thanks Dad' campaign, which I'm definitely on board with as I'm definitely guilty of not saying 'thanks' to my Dad often enough. Now there's a number of stories I could share, including driving to Leeds festival in my Car (which my Dad renamed as the inbetweeners car), but there is one journey in paticular that was very memorable for me. Back in 2015 I spent a Summer doing a cultural exchange placement at a Summer Camp in the USA (you can read more on that in this post.) Despite months of pre placement prepping I was placed at camp at the very last minute... and I had to fly out from Heathrow. Luckily my Dad very kindly offered to drive the 370 mile round trip to drop me off at the airport (which I'm still thankful for two years later!) So on a *very* early June morning we got into the car (we being myself, my Mum and my Dad) and began our long journey to Heathrow. I won't lie I was very nervous on the journey to the airport, I'd never been away from home for so long, but my nerves started to turn into excitement as I chatted away with my parents. I vividly remember early morning Radio 2 playing in the background and us having a bit of a laugh singing along. After a number of hours in the car we finally arrived at the airport where sat and enjoyed coffee together before it was time for me to head stateside for the Summer. You can read more about the #ThanksDad campaign and read more #ThanksDad posts from other lovely bloggers here. This post was written as part of The Car People's 'Thanks Dad' Campaign. I was not paid to write this post and all opinions expressed are by own (my full disclaimer policy can be found here).